So, I’ve been using Firefox for the better part of week now. Honestly, I’m a little surprised I’ve lasted this long. I’ve made some progress with a couple of the issues that I mentioned in my earlier post about the switch to Firefox. However, some new problems have also arisen. Predictably, as time went on, credentials became less of an issue. I am now to the point where authentication is no different than it is in Safari. Mozilla’s Asa Dotzler has also assured me that contextual menus will be much improved in the next update. At Download Squad’s advice, I also installed the GrApple Delicious Blue theme which makes Firefox look very much like Safari. Overall, it’s certainly an improvement and, best of all, the ugly blank favicon icons have been replaced with the same nice globes that Safari uses. I still have no complaints about Firefox’s speed. Unfortunately, as I’ve used Firefox more, its faults have become more apparent. My biggest beef with Firefox is its download management. I hate the popup that comes up whenever I download something asking what I want to do with it. I also miss the nice little files that Safari had with the progress bar right on the icon. Firefox just plops the actual file in your downloads folder and leaves you to guess when its complete. Of course, I could check the download’s progress in Firefox itself, but Download Statusbar seems totally incapable of giving accurate information (this isn’t Mozilla’s fault, of course, but still). Firefox also lacks Safari’s PDF handling. I like the ability to just look at a document without having to download it, but in Firefox, there’s no such option. Firefox’s history menu also really bugs me. To view anything from more then a couple minutes ago, you have to open up the history sidebar. In Safari, you can access days of history from the menu alone. Considering that I left Safari to escape a text entry bug, it’s ironic that I’ve run into another (much less annoying) text entry bug in Firefox. On Facebook (and maybe other sites, but I haven’t found any), I get an annoying little line coming off the cursor which makes it look like I have an extra apostrophe. As you can see below, the some affliction doesn’t affect Google (and other sites which I tested). I’m not sure who’s at fault, but it’s a pretty annoying bug, especially when using Facebook Chat. Even considering all this, I don’t think I’ll be switching back to Safari anytime soon. Especially with version 3.1 on the way and a growing number of Add-Ons, it seems that Firefox can only get better. Some time ago, I made the decision to move past David Lanham’s Agua folder set (as lovely as it is). I settled on Pry by Jonas Rask (who has a variety of excellent work). Pry was designed for Leopard and therefore includes all the necessary icons (downloads, etc.). However, the folders are not front-on (something I mentioned about Agua v.2), so they don’t really jive with CoverFlow. This problem is solved by the Pryspective set by Vibe Star AKA Sander van der Heijden. While making the Pry folders CoverFlow-compatible is certainly a good idea, I’m not a huge fan of the Pryspective icons. Unless you’re a big CoverFlow user, I’d go with the regular Pry set. Jonas created a number of variants including both etched and overlaid versions (I prefer the more colorful overlaid Pry Aluminum set). He has also made matching hardware icons and CS3 and MS Office-specific folder sets. MacThemes members have also made a variety of versions including “Pry Ply” (wood), white, red and chocolate. For those who don’t know, the best way to apply new icons (such as the Pry and Agua sets) is to use Panic’s CandyBar. While you can do it manually (some icons more simply than others), CandyBar is much, much simpler and its integrated icon organization features make it worth the $29 price tag if you’re really into customizing your computer. Of course, there’s also a fifteen day, somewhat limited trial (you can only have 250 icons in your library) available. As I mentioned earlier, I’ve recently transitioned from being an ardent Safari fan to using Firefox. While the plugin-ability of Firefox is certainly nice (even if many individual plugins are rather clunky), that’s not the reason I switched. As I also mentioned before, I was experiencing an extremely obnoxious text entry bug in Safari (on the bright side, it taught me a lot of ways to get rid of text without the delete key) and I figured it was time to get away from it. I was kind of dreading having to manually bring all my Safari bookmarks across to Firefox. However, Firefox offers a handy little import wizard that allows you to bring just about all your data from Safari (or another browser) into Firefox. While it worked as advertised, I was left with the bookmarks in Firefox in addition to the ones that were imported from Safari. While deleting the duplicates wasn’t as much work as entering them all manually, the transition still could have used some smoothing out. Even with 1Password integration, most credentials need to be reentered for the new browser, but I suppose that’s to be expected, and it’s not a terrible pain. Obviously, I’m a pretty big interface junkie: The AHIG is practically my bible, and I like all my applications’ interfaces to be as coordinated as possible. Since it was developed by Apple, Safari is pretty clearly on the top of the heap as far as interface matching with the rest of the OS goes. While Firefox 3’s interface is a massive improvement over its predecessor, there are still some elements that don’t sit too well with me. Firefox relies pretty heavily on favicons: They show up in the address bar, the search bars, the tabs. Now, on a conceptual level, I have no problem with this; favicons are a nice visual aid to navigation. However, the realty is, most favicons are pretty ugly and I would rather not have to stare at them constantly. I’m also something of an interface minimalist, and since I can get on just fine without favicons, I prefer the cleaner look you get without them. Also, considering how much time I have to spend looking at them, I wish Mozilla would provide something other than an ugly document icon for the blank favicon. It’s a minor issue, but Firefox’s non-standard contextual menu also bugs me. I’m willing to look past the squared edges and such, but what really gets to me (since it’s what I use the contextual menu for most often) is the spell checking– it just looks so much worse than the layout the rest of the system uses. Once you consider plugins, many of which are pretty disastrous interface-wise, Firefox can be something of a visual train-wreck on a Mac (and believe me, themes don’t help). One of the main reasons I’ve been so resistant to Firefox is its speed: I’ve always thought it was a slowpoke compared to Safari. While I’m pretty sure the benchmarks still indicate that Safari is snappier, I haven’t been noticing much of a difference in my everyday browsing. When it comes to load speeds, it seems like the two browsers are pretty evenly matched. Admittedly, Safari does not have a whole lot that Firefox lacks in terms of features. Off the top of my head, I think the ability to resize text boxes is the only thing which Safari has and Firefox doesn’t. With a plethora of plugins available, Firefox is pretty much set for features. While it would be nicer if it had things like private browsing and easy user agent switching out of the “box”, installing plugins is easy enough that I don’t really mind. Ad blocking, one of my favorite features in any browser, is really quite impressive in Firefox thanks to the Adblock Plus plugin. While AdBlock for Safari is very unobtrusive and does the job 90% of the time, Adblock Plus, while slightly more obtrusive, offers more effective, fine-grained control. Firefox is a nice browser, sure, it wouldn’t be gaining users like crazy if it wasn’t. It has great features, especially with extensive plugin-ability, and although the interface isn’t everything it could be, Firefox is just as fine a browser for OS X as Safari is. That said, if that pesky text entry bug were to resolve itself, I’d be back to Safari in a jiffy. Some things just feel right. For quite a while, Agua by David Lanham has been my favorite icon set. A while back it was updated for Leopard with 512×512 icons, slight restyling and additional Leopard-specific icons (downloads folder, Time Machine drive, etc.). However, because these folders were angled (rather than front-on like Apple’s Leopard folders) they looked super messed-up in CoverFlow. Now (well, a bit back) David Lanham has updated the folders so they are front on (he also added a couple drive icons and another alternate downloads folder) and look decent in CoverFlow. If you use the Agua Leopard icons or are looking for an alternative to the regular icons in Leopard, check out the twice updated Agua icons. If you were wondering, I do hope to make Desktop Extras a regular feature (I made a banner for it and everything). I plan to cover things such as icons, wallpapers, dock styles and whatnot. As always, if you have suggestions or questions for Desktop Extras (or any other feature) give me a shout in the comments or you can email me (see the contact page). Some people did not like the agèd nature of MacJournal during the original match. So now, considering that MacJournal has just released a new version and Journler will soon be going commercial, I figured I would do a “fairer” match-up. 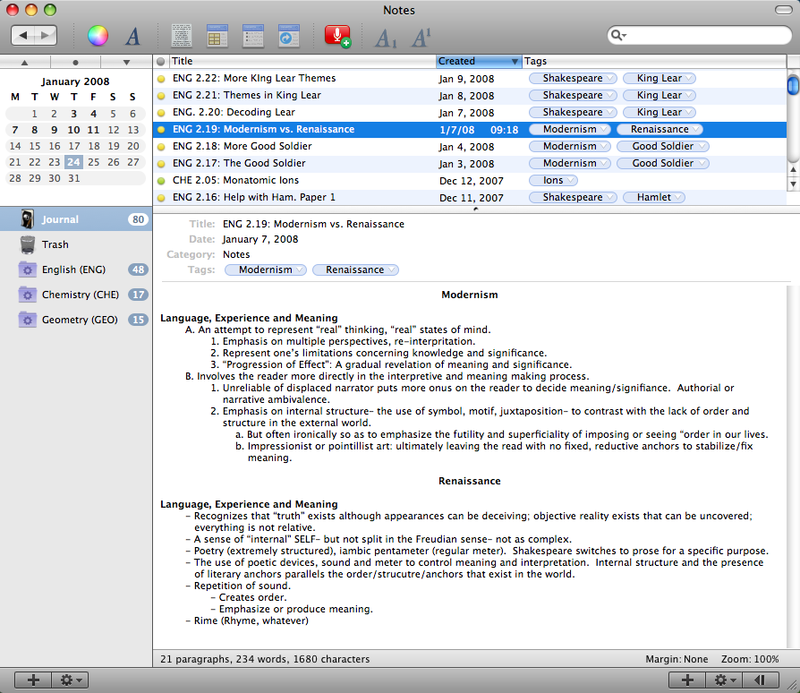 I must say, kudos to Mariner for the improvements in the MacJournal interface. It is starting to look like a nice, Leopard-worthy app. However, one thing I simply do not get is the fact that some of those godawful toolbar icons from v2 are still hanging around. I mean, they have a new dock icon, I don’t think it would kill them to get some new toolbar icons as well. Those hideous, Panther-y icons are what’s really killing this interface. I’m not crazy about the fullscreen here (but I’m not really big on fullscreen writing anyway) but it is quite customizable. The option to display entries either in the sidebar or above the actual entry text (like you would see messages in Mail) is nice. The calender looks a bit odd swimming in a see of white space when one’s sidebar is extra wide but otherwise it looks a-okay. One thing I do not like is that while in three-pane view, the entry list does not have an alternating background. The entry selection buttons (on the far left of the toolbar) are a little odd because they go up and down rather than left/right. Although this makes more sense I still think it looks a little odd (however, the plastic finish on the buttons is nice). The Journler interface recieved a pretty small facelift with the latest update. The main change is that I noticed is slightly more spacing in the entry list. Overall, the Journler interface is quite similar to that of MacJournal. I prefer the calender in Journler and I obviously prefer Journler’s toolbar icons. Magically, Journler finds out what your system folder icons and uses them in its sidebar. I also like the more integrated header in Journler because it is both easier to fill out and, in my opinion, looks better. MacJournal: 7/10 – This would be a really solid interface if Mariner would just redo those buttons! Journler: 8/10 – A nice, consistent interface that could use a couple tweaks. I’m not sure if journals in MacJournal are supposed to act like folders, but I’m not feeling it. Although journals can be placed inside each other, I really don’t like how the hierarchy works. Bad folder structure aside, MacJournal has all the features I would expect. It has wiki-linking, labels, fullscreen and blogging as well as sound and video recording. Journler has finally brought real tags, a feature I have been waiting for for a while. 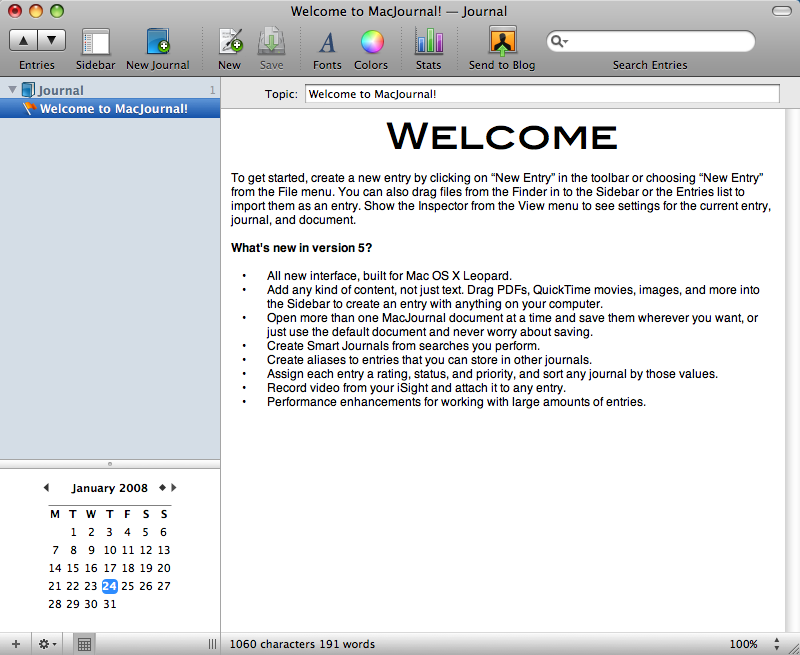 Journler has all the features of MacJournal except blogging support which was recently dropped because the developer decided it was an underdeveloped feature. However, I do feel that the fullscreen (which includes all three panes rather than just the text) isn’t as strong as the fullscreen in MacJournal. MacJournal: 7/10 – Bad folder hierarchy aside, a very nice set of features. Journler: 7/10 – Good features but no blogging and fullscreen is lacking. Journler is ahead by just a little bit and because it will be selling for ten dollars less, I think it’s the better choice. MacJournal ($34.95): 14/20 – Needs more polishing, but it’s a good app at the core. Journler ($24.95 as of v2.6): 15/20 – A good journaling application that needs a bit of work in some areas. Look here for more screenshots from this edition of Software Sumo. Yes indeedy, time to review alarm clock applications: Aurora, Awaken and Alarm Clock 2. I have decided to review the Aurora 4 kinda-private beta rather than the stable version 3. I know I may be criticized for this just as I was for comparing an old version of MacJournal to Journler, but deal with it. (I was originally planning to review Alarm Clock Pro as well, but my trial has expired and I do not know it well enough to review it without playing around for a while). The new version of Aurora boasts a nice new interface. Although it is basically the same as the old one functionally (meaning users of Aurora 3 will have no problem using it) it has nice new graphical elements that really bring it up to speed with the new OS. I love the new toolbar icons, and although the sheep was cute, I’m glad to see it go. Overall, Aurora 4 presents a nice, simple interface that is really all about the alarms, making it very easy to do what you’re supposed to– wake up. That said, it does lack a full screen option for both alarms and the Fall Asleep option. Awaken also has a nice interface with a semi-transparent clock as the centerpiece. Although the clock looks nice, it doesn’t serve any real purpose in my mind and just serves to distract from the alarms (in Awaken, there is a dropdown box for editing alarms). I’m not too crazy about the “back-end” interface for Awaken, but the full screen interfaces can’t be beat. For both alarms and falling asleep, there is a gorgeous full screen display showing album art et al (similar to Front Row). Alarm Clock 2 hasn’t been updated in a while and is starting to show it. A couple years ago the simple transparent alarm was nice, but now it is starting to age. Combine this with pre-Tiger graphics in the back-end and you’ve got a problem. The back-end is also accessible only from the menu item which really annoys me. Perhaps this application would be best for your blind aunt. Aurora: 8/10 – A gorgeous, clean interface. But no fullscreen. Awaken: 9/10 – Not the best back-end, but the fullscreen is to die for. Alarm Clock 2: 6/10 – It seems my alarm clock has woken me up in 2003. Aurora has the two main features we have come to expect in alarm clock apps: the alarm, of course, and also the fall asleep option. The alarm is clean, easy to use and reliable because it uses Aurora’s built in player rather than iTunes (I quit using Aurora 3 because its iTunes reliance effected dependability). The alarms play in a pane of the main window that shows album art and a variety of other information and options. Although the fall asleep pane has more options than the one in Awaken (you can choose to fall asleep after a number of songs, at a specific time, once a movie has finished or after a set number of minutes) I find it annoying that Aurora will not start iTunes/Quicktime/DVD Player like Awaken does (because, let’s face it, I’m a lazy bum. However, some people probably won’t mind this). In addition to iTunes, Aurora also has EyeTV support but I haven’t had a chance to use it. Otherwise, Aurora doesn’t have a ton of extra features (this isn’t a bad thing however, it has everything I need). Awaken has alarms and fall asleep just like Aurora, but no EyeTV support. To make up for it, it has a timer (and of course, full screen). By far my least favorite part of Awaken is the fact that it still uses iTunes for just about everything. You can use sound alarms that play right from Awaken, but these are limited to certain file types (and you miss out on album art). However, I have not found this reliance to effect reliability (not much anyway, the first time it didn’t go off because iTunes wanted me to update). The only option for falling asleep is after a certain amount of time. This is kind of a pain, but overall I think the fall asleep option is stronger here than in Aurora. The timer is pretty simple– you tell it when to go off and it does. Easy as that. Alarm Clock 2 does not have a fall asleep option. However, it does have both a timer and a stopwatch. Surprisingly, Alarm Clock 2 plays alarms locally and because of this it has never missed an alarm (I used it for quite a while). Also nice is the ability to choose a specific song in a playlist rather than having to play from the beginning. Aurora: 7/10 – Has the two most important features but no fullscreen (and the fall asleep option isn’t the best). Awaken: 7/10 – The biggest weakness is its use of iTunes for playback. Alarm Clock 2: 6/10 – No fall asleep but some other handy features. Because Aurora and Awaken are so close it really comes down to personal choice. If you’re not big on fullscreen, Aurora is probably the way to go. However, if you really like the fullscreen and other showy effects, Awaken is probably the way to go. And, if you’re hard-up on cash, Alarm Clock 2 (or Aurora 3) will do in a pinch. Bottom line, pick up your trial of Awaken and the Aurora beta and see which you prefer. Aurora (v3 is free, but v4 will sell for an unknown price): 15/20 – Great interface even without fullscreen. Easy (and fun) to use. Definitely a strong contender. Awaken ($12.95): 16/20 – The fullscreen really makes up for some rough bits. A great, great-looking app that’s pretty good as far as first things to see in the morning go. Alarm Clock 2 (Free): 11/20 – Bad interface and a mixed bag of features. That said, the price can’t be beat. Additional screenshots for this edition of Software Sumo can be found here.